Before Photo of Bathroom Remodel in St. Charles IL. 60134. Looking to remodel your bathrooms or kitchen? Call Southampton. Over 30 Years in Custom Renovations & Remodeling. Transitional Bathroom Design in St. Charles & Naperville Illinois. Looking for a bathroom contractor? looking to add an addition to your current house for first floor master suite? Call Southampton for all your remodeling & Renovation needs! We Removed the Outdated Whirlpool Tub to make the room feel more open and remove any tripping hazards that existed for guests. Adding the Shower was More Comfortable for Guests to use and made the Walk Way Larger to. Going with a Transitional Design with Subway Tile in the Shower, Oil Rubbed Bronze Fixtures, a Rustic Walnut Vanity & Leathered Granite. Take a Look at the Picture Below. First Floor guest bathroom remodel in this St. Charles IL. Custom Home. Looking to Remodel & Update your Bathrooms in St. Charles IL? Call Southampton Builders for All of Your Custom HomeRenovation Needs! Here is what we began with. This Huge Tub was the only way to bath in this 1st floor guest room. We Removed the Tub and Created a Standard Modern Bathroom with Large Walk in Shower & Transitional Bathroom Design. Shower Remodel in this St. Charles IL Custom Home. Master Shower Renovations & Remodeling in Naperville IL. 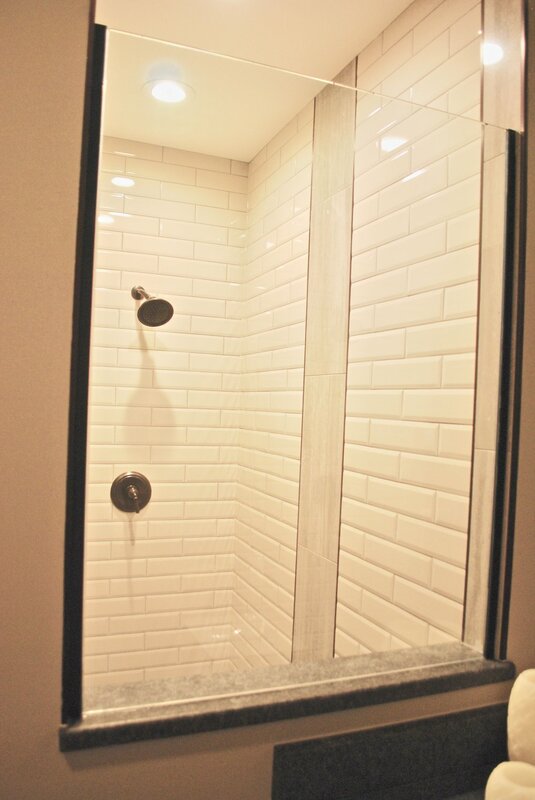 We Created a Walk in Shower With Glass Door & Panel to Open the Room Up but Give Privacy to the Shower. Replacing the Dated Laminate White Vanity from 1992 we Chose a Timeless Walnut Rustic Custom Vanity with Matching Oil Rubbed Bronze Hardware. Leathered Granite Kept Us in Budget While Giving Us a Modern and Transitional Flair. This Vanity was the TOP of the Line back in the Day. But its day had Come and Passed. Take a Look at What We Did with the Space! Custom bathroom vanities in Illinois. Custom bathroom remodel in st. charles il. Home Updating & renovations. Naperville IL. Thanks for Taking a Look at One of Our Past Completed Remodel Jobs! If You Have a Bathroom or Kitchen Remodeling Project You Are Thinking About Completing, Please Give Southampton a Call for a Free Quote Today!